(CNN) – Romney defended himself Sunday from an upcoming Newsweek cover that suggests he's a "wimp." Hitting the stands Monday, Newsweek's cover blares: “Romney: The Wimp Factor.” In smaller text, it asks: "Is he just too insecure to be president?" Bush went on to win the 1988 election Michael Dukakis. Romney is currently in Israel on the second leg of a three country foreign tour. Wimp or not, he's sure proven on this trip he's a Not Ready for Prime Time Player. He's an embarrassment. Imagine how bad it would be if (God forbid) he was actually president. He can sleep at night,will we if he becomes President? Romney wants us in yet another expensive war with Iran. The GOP are war mongers. Yet, Romney was a draft dodger during Vietnam and his sons serve our country by "working on his campaign." He doesn't send his sons to be killed yet he wants to send our boys. Vote Obama and Democrats to save American lives. Pawlenty deserves it much more. Mitt( I have nothing to offer)McCain is Snooki Palin 2012. I think Newsweek might have hit the nail on the head. This guy in spite of the wealth doesn't come across as somebody I want answering the phone at 3:00 a.m.
Bullies and people who get their kicks by abusing animals are, deep down inside, not sure of themselves and consider themselves tiny little people who need to do what he has done to feel like the big guy he isn't. His hand wringing still gives me shivers when he was with the black kids. He couldn't have felt more uncomfortable. This is the difference between him and the President and that wife of his and Mrs. Obama. They think they are sooooooooooooooo much better than the rest of us. They are NOT! Wait! He's not a wimp, he's very strong on changing positions completely on key issues.to keep in line with his billionaire right=wing puppeteers. I wouldn't count on the George H.W. Bush presidency saving Romney from the wimp factor unless Obama puts on a helmet and gets in a tank. Maybe Romney could try putting on the flight suit and flying onto an aircraft carrier to prove he's got what it takes to get us into a couple of more wars. If circulation numbers/revenue are any indication, looks like Tina Brown's plans to re-design Newsweek as a “thought-leader” publication appealing to affluent readers. Looks like the mag is projecting its own "wimp factor." Not the calibre of verbiage I would expect from a serious magazine intent on inserting itself into presidential politics. Wimp? I can think of dozens of names we could call him that would be more descriptive and accurate. 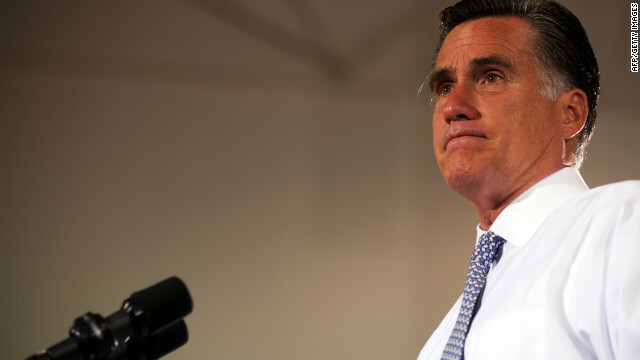 The only thing I like about wimp is that it has four letters – that's a good number for Mitt. Obama and the dems are shaking in their shoes. They've asked the media to pull out all the stops. Obama has been forced to make personal election adds walking back his "you didn't build that" blunder. What a goof??? Of course he sleeps well at night. His worth hovers around 25 million regardless if he succeeds or not. If we could all be so fortunate.